This is an, let's call it accidental post. I was looking into transactional CDI observers and playing around with GlassFish embedded to run some integration tests against it. But surprisingly this did not work too well and I am still figuring out, where exactly the problems are while using the plain embedded GlassFish for that. In the meantime I switched to Arquillian. After I looked at the Arquillian 1.0.0.Alpha4 a bit more detailed last year, it was time to see, what the guys prepared for 1.0.0 final. Some stuff changed a bit and I was surprised to only find some basic examples on the net. That was the main reason I started writing this post. To have a more complete example of all the three technologies working together. First of all, get yourself a fresh copy of latest NetBeans 7.1. It's out since a few weeks and it really looks good. If you like, you can download a copy of the Java EE version, which comes with latest GlassFish OSS Edition 3.1.1 pre bundled. Install it and fire it up. Also grep a copy of MySQL Community Edition and install it. Back in NetBeans, setup a new Maven Webapplication via the new Project Wizard. Let's call it "simpleweb" and we tell it to run on GF 3.1.1 (if you haven't done so, you should create a Services>Server>GlassFish instance before or do it during the project setup). Even if this isn't test-driven, I like to use this approach because I still believe, that this is the most common case you find out there in your projects. You have a lot of stuff ready to run and you are looking for some kind of automated integration tests. So, let's assume you have a very basic entity, we call it "com.mycompany.simpleweb.entities.AuditLog". You can create it with the NetBeans new Entity wizard. 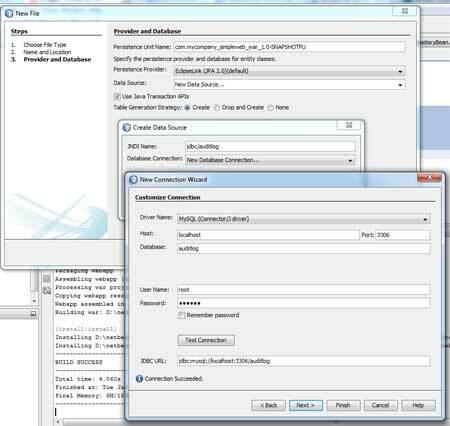 The third step during the Entity creation is the provider and database setup. Define a new Datasource and name it "jdbc/auditlog". As a connection specification use MySQL J driver and I assume you have a database up and running (let's assume this is called auditlog). Test the connection and finish the wizard. If you are using the wizard, make sure to check your pom.xml. The wizard is adding some eclipselink dependencies in scope provided, so this shouldn't make a big difference here. Next is to add a com.mycompany.simpleweb.service.AuditRepositoryService EJB. This should be responsible for all CRUD operations on the AuditLog entity. Beside that, you also need the embedded Glassfish dependency. Let's take a look at the the tests. Now it's time to define the deployment archive for the test using ShrinkWrap. The deployment archive for the test is defined using a static method annotated with Arquillian's @Deployment annotation. After the packages which should be contained are added, an empty beans.xml (which should be enough for now) is added and the test-persistence.xml is added as a manifest resource named persistence.xml. Great. One last thing is to define the test itself. We are inserting a simple test entity and are getting the count back from the database which is checked via assertEquals. That's all. Fire up your tests. 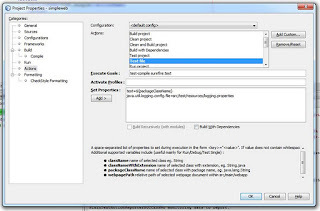 (Right click on the AuditRepositoryServiceTest class and select "Test File (Strg+F6). JDBC connection pool mysql_auditlog_rootPool created successfully. JDBC resource jdbc/auditlog created successfully. INFO: test was successfully deployed in 6.461 milliseconds. 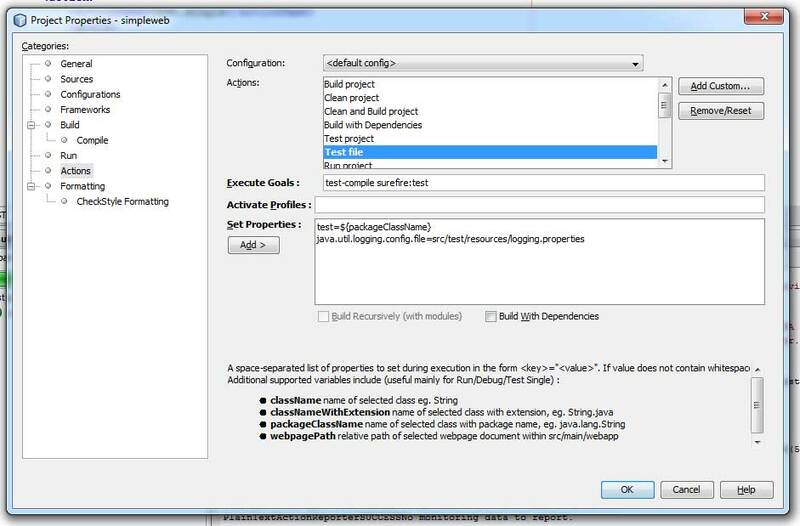 If you now issue a clean and build, you see, that the desired log output is shown in the NetBeans build output. Now you also see the desired log-level output with a single test-run. That was it. You can download the complete sample maven project (as ZIP-File) with the mentioned classes and play around a bit. Have fun!